Riviera chief executive Wes Moxey said the 4800 Sport Yacht – with two staterooms and two bathrooms – proudly takes external design cues from the Riviera 6000 and 5400 models, for which there is extremely strong worldwide demand. “The 4800 has all the Riviera Sport Yacht hallmarks – sleek styling, leisurely single-level living and entertaining features, premium levels of luxury and superb sea-keeping capabilities – embedded deeply in her DNA,” he said. “For the new 4800 Sport Yacht, Riviera will introduce a robust and responsive new hull that perfectly matches the state-of-the-art Volvo Penta Inboard Propulsion System (IPS). Mr Moxey said the 4800’s fully equipped cockpit enhances the easy alfresco lifestyle valued so highly by Riviera luxury motor yacht owners around the world. “Storage solutions abound on the 4800 with cockpit lockers under both the aft and starboard lounges,” he said. “A hatch is in the cockpit floor to provide access to the servicing pods, while there’s also an optional folding teak table to connect both lounges. “To port there is a solid surface bench-top, wet bar with refrigeration, ice-maker and sink with hot and cold water tap-ware. “And on both sides of the 4800 Sport Yacht, there are steps up to the wide walk-around side decks, which feature raised bulwarks and full-length bow rails for safe access to the forward deck. Mr Moxey said the new 4800 Sport Yacht is at the vanguard of on-water luxury motor yacht design courtesy of her interior spaciousness, premium comfort and practical lifestyle features. “When the celebration begins, a cocktail cabinet to starboard features a lift-up lid, revealing bottle storage and drawers for glasses,” said Mr Moxey. “Forward, an elevated, leather-upholstered, C-shaped lounge provides excellent visibility forward and through the wide side windows and seats up to six adults around a large, fixed dinette table. “Natural light fills the expansive interior living space, with the side windows able to slide open for cross ventilation when desired. Mr Moxey said the most discerning Riviera skipper will appreciate the high degree of boating knowledge and consideration drawn up to create the ergonomic design of the 4800’s luxury sports-inspired helm. 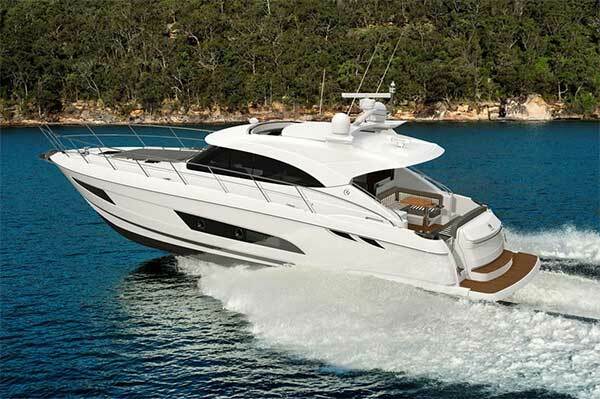 “The command centre of the 4800 Sport Yacht features the latest Volvo Penta/Garmin Glass Cockpit navigation and systems monitoring features, with two 12-inch multi-function display screens set into the sunken dash,” he said. “Within easy reach of the two deluxe helm chairs – which each have folding arm and foot rests – is the premium leather-upholstered steering wheel, electronic engine controls and IPS joystick for easy docking,” said Mr Moxey. “Visibility through the two curved glass windscreen panels is also excellent, with each featuring pantographic wipers and washers that are plumbed off the fresh water system,” he said. Mr Moxey said this space is the perfect teenager’s retreat, games centre … or even a quiet work space. At night it can also provide sleeping for an extra guest. “Natural light filters into the atrium through from the saloon and the fixed starboard-side hull window, and an overhead hatch opens for fresh air and features a flyscreen or block-out screen when required,” he said. Mr Moxey said the master stateroom also features additional storage cabinets with positive locking hardware outboard, with a cedar-lined hanging locker and automatic lighting to starboard and a cedar-lined storage locker with shelves to port. This stateroom has its own private en suite with contemporary styling and an overhead hatch for fresh air, which also screens for privacy when required. “The VIP guest stateroom amidships features full headroom at its entry, where there is a cedar-lined hanging locker at the entry, as well as three adult-sized single beds. There’s the option of sliding together the two port-side beds to create a double,” he said. “The Volvo Penta diesel engines and IPS pod-drives are set wide apart for responsive steering and stability. This drive package offers spirited performance and fuel-efficient cruising economy,” said Mr Moxey. Mr Moxey said the many benefits of Volvo Penta’s IPS technology included highly efficient Anti-Corrosion Protection (ACO) unit mounted to the transom to reduce the maintenance of sacrificial anodes. “This new 5-year limited warranty for Riviera owners is complemented by our own 5-year structural warranty for our world-class hulls. Now Riviera and Belize owners can enjoy Volvo Penta’s proven and easy-to-use technology with greater confidence than ever before,” he said. 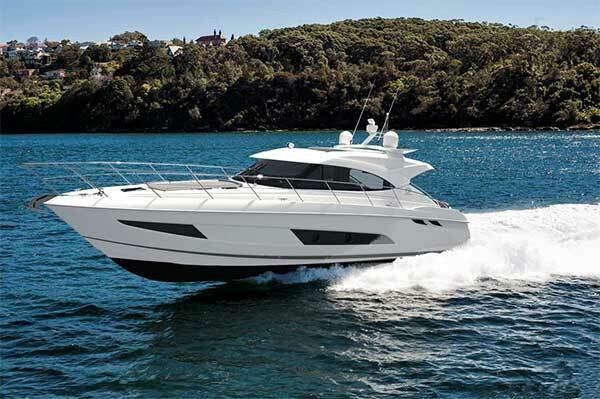 Mr Moxey said the talented Riviera team was looking forward to showcasing the comprehensive features of the 4800 Sport Yacht when Riviera rolls out the red carpet for Sydney International Boat Show at the end of July. “Riviera has a rich 36-year heritage enhancing the fun and fulfillment of our global family of discerning luxury motor yacht owners and the 4800 Sport Yacht reflects how we are continuing to make boating with Riviera such a rewarding experience,” he said.